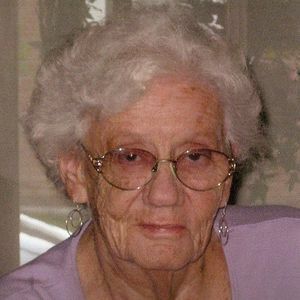 GREENVILLE - Mary Estelle Nelson, 83, of Luzerne, passed away March 13, 2012 at Muhlenberg Community Hospital following an illness of three months. She was born December 1, 1928 in Graham. Estelle was the youngest and the last surviving child of James A. and Cecil Vinson Tarrants. Estelle graduated from Graham High School in 1947 and worked briefly in Louisville and Chicago before becoming an LPN at Muhlenberg Community Hospital. She retired from the Hospital in 1992 after working there for over 35 years. She was a member of Luzerne General Baptist Church. Estelle married Raymond H. Nelson Sr. in 1964, a union lasting until his passing in 1984. Estelle was predeceased by her parents, husband, four brothers and four sisters. Estelle is survived by a son and two step-sons: Charles and Noel Tarrants of Delhi, NY and their children Elianna, Carter and Owen Tarrants all of Delhi; Raymond Jr. and Wanda Nelson of Hopkinsville and their children Jerry Goff of Elizabethtown and Troy Vowels of Hopkinsville; and Jack and Pat Nelson of Graham and their children Carrie and Travis Nelson of Graham and Amanda (Paul) Walker of Greenville. She is also survived by ten great-grandchildren, a close niece Jean (Shelby) Clark of Nortonville, many nieces, nephews, and cousins and a special friend Jeanie Rolley of Graham. Funeral services will be Friday, March 16, 2012 at 2:00PM at Luzerne General Baptist Church, with Rev. Roger Wright officiating. Burial in Luzerne Cemetery. Visitation will be Thursday after 5:00PM and Friday from 8:00AM until 12:00 noon at Tucker Funeral Home in Central City. Mrs. Nelson will lie in state at Luzerne General Baptist Church on Friday from 1:00PM – 2:00PM. Expressions of sympathy may take the form of contributions to Luzerne General Baptist Church, 492 Luzerne Depoy Road, Greenville, KY 42345. Tucker Funeral Home is in charge of arrangements. Online condolences may be made at www.tuckerfuneralhomes.com. Estelle lived her life with great strength and quiet dignity. She was a wonderful mother-in-law to our daughter Noel and a loving grandmother to Carter, Ellie and Owen. We will miss her mischievous grin and quick wit. Such a sweet lady. I'll always remember the times we spent with her. Will always remember the good times shared with Aunt Estelle and Uncle Red and the times after he passed . Many fond memories will be remembered even the car trips up to Graham with all of us kids piled inside dad's stationwagon. many others to help fill the void she has left behind. Prayers being sent to all from my family to yours. May GOD bless you each and every one this day. She was a dearly loved woman i just wish i would have got to know her better. My prayers are with the family during this time. Aunt Estelle was a lovely lady. She will be greatly missed. So very sorry for your loss , thoughts and prayers are with you. Mrs. Nelson, to me, was the embodiment of strength, determination, and courage. Her great love for the Lord, never doubting never questioning, was and is an inspiration to me. I am forever grateful to her for the laughter and smiles she brought into my life. Mrs Nelson, I will remember and hold you dear.